After five years or so the Fifth Dominion has gotten a bit more than just another facelift. This is a whole new site with lots of new features to come. Please feel free to make suggestions and let me now how things are going. You can COMMENT below OR in the FORUM. Another year has come and gone but the Fifth Dominion stays afloat. In fact, it is just drifting along and in need of a bloody resurrection. Call Uncle Frank or Harry D'Amour!!! Or better yet make some suggestions as to possible directions for us to go. The days of social media are upon us and taking over. In case you missed it... Clive Barker released his much anticipated Pinhead Vs. Harry D'Amour story which is the sequel to his previous novella The Hellbound Heart. Be sure to grab your copy and comment in the forums about what you think of it. 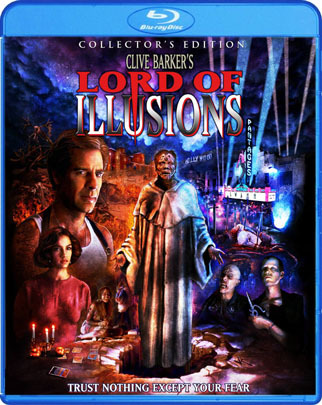 Scream Factory just unveiled the brand new Clive Barker-approved artwork for the upcoming Collector's Edition release of LORD OF ILLUSIONS. The plan so far is that they will release a 2-disc set which will include the theatrical cut on Blu-ray and a DVD of the Director's Cut. (Expect pre-order links to go up sometime in early September). Click here to order the film. Beacon Audio Books have teamed up with Clive Barker to produce, narrate, and distribute audio versions of "Incarnations" and "Forms of Heaven" which are collections of Clive Barker's plays originally written for the stage. They are scheduled for Fall of 2014. Ryan and Jose talk with Johnathan Clayton, Company Manager and Eric Scott Evans (who plays Crazyface) about their production of the play in Philidelphia PA.